NBC heard your pleas, Chuck fans: our favorite geek spy Chuck is back for another 13 episodes starting this fall. 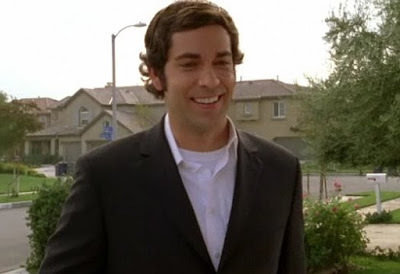 The Hollywood Reporter conjectures that Chuck may have been saved due to fan support that included patronizing the sponsor Subway (good move, fans) and Zachary Levi's own support of the network by fulfilling all his publicity and PSA duties. Whatever the reason, it's good to see this smart, funny, action comedy has been renewed. In other good news, ABC has renewed the wickedly absurd corporate parody show Better Off Ted. Perhaps the modern sitcom isn't dead yet. The ensemble cast of Better Off Ted each week takes the Scrubs-like off the wall humor and runs with it. The show writers aren't afraid of any issue, as illustrated by the Better Off Ted episode that dealt with the new motion sensors in the office not registering black people. It wasn't considered "cost-effective" to replace the sensors, so corporate policy instead decided to install separate drinking fountains, and then hired white people to follow the black employees around the office to set off the door, elevator, and fountain sensors. Both horrifyingly funny and a terrifyingly accurate jab at corporate inanity, Better Off Ted doesn't pull any punches. For all you Nathan Fillion fans, the good news keeps coming. Castle has also been renewed for another season, hopefully boosted by the last couple weeks' lead-in from Dancing With the Stars. While still a bit rough around the edges, Castle has its charms, most of them in the form of Fillion himself. Here's hoping they can tighten up some of the supporting cast. The biggest surprise thus far, even to Joss Whedon himself, is that FOX has renewed Dollhouse for another season. While I wasn't a fan of this show, word is that it improved as the season progressed. The big news is that FOX actually listened to what fans of all niche shows have been saying for years--they looked at DVR, streaming vid and iTunes downloads numbers and realized there were actually a fair number of viewers tuning in. The Chicago Tribune's Maureen Ryan questions if this means the end of Nielsen ratings dominance, and I hope it does. I'm glad that FOX took a chance on an independent and unique show, but I sure wish they'd gotten their act together for Firefly instead. Stay tuned to TV News and Reviews for more info on the upfronts. Confirmation of these renewals should come on Tuesday when many of the networks announce their full fall schedules. That's great news about 'Better Off Ted.' Love that show! Let the meat blobs roll! guess ABC does have a little bit of sense after all. I'm so happy that Chuck will be back, but only 13 epeisodes? That doesn't exacty exude confidence,does it? Guess beggars can;'t be choosey, huh? Now, to wait on the fate of Reaper! @Ms Terri: I LOVE Better Off Ted...and lol on the meat blobs--that cost 5 million bucks to produce...hee! I am SO happy it's coming back. @MM: I am stunned, I tell you, *stunned* that ABC renewed both Better Off Ted and Castle. I think 13 episodes is akin to a trial run, but it's not *that* unusual these days. I think Medium only had 13 this season but then they upped the order when some of their other shows didn't pan out. Last I heard, it didn't look good for Reaper, but I'll have to confirm that. well, they did say that last year, too, but i think the strike pushed them into ordering it this season.